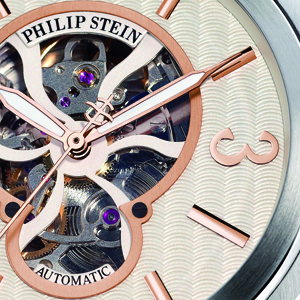 For Philip Stein, luxury is not necessary synonymous with complications or expensive materials. Its richness is to be found at another level – that of well-being. The new Prestige Round „Skeleton Heart“ watch is equipped with Natural Frequency Technology: an integrated metal disc that interacts with the body’s frequencies, balances out its wearer’s energy flow and strengthens his or her resistance to stress. It thus becomes far more than just a watch. Nonetheless, the watchmaker has not neglected aesthetic refinement. 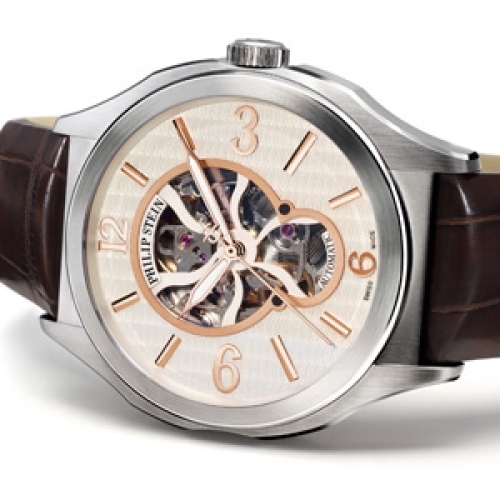 The grey dial features a guilloché motif and an openworked centre revealing the movement beating below. The pink gold-plated applied hourmarkers harmoniously accentuate the “zen” attitude radiating from Philip Stein timepieces. Three case sizes and a broad range of dials ensure that the Prestige Round „Skeleton Heart“ can be adapted to each and every situation.